The Diamond Princess docked this morning at a container port on the Huangpu River, about an hour’s drive from Shanghai. The weather was foggy, with a light drizzle, and at 55 degrees, not particularly inviting for walking tours through the French Concession and the Old City. At about 8:30 am we boarded shuttle buses into the city. 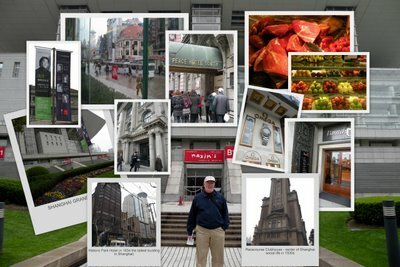 From the terminal near the People’s Park, we walked past the magnificent Shanghai Grand Theatre and down Nanjing Lu (Rd) toward Zhongshan Lu (the “Bund”) which runs along the Huangpu River. Much of Nanjing Lu - divided into East (Dong), and West (Xi) and stretching for several miles - is a wide pedestrian mall, with excellent shopping. Nanjing Lu was the main retail district in Old (1930s) Shanghai and remains so today, with many of the old shops, refurbished and renamed, flanked by upscale new ones. The rain stopped for a while, but the weather continued to be chilly and windy. We finally reached the waterfront, but there was so much construction on the roadway that we couldn’t see the river, or really take in the sweep of the Bund. We walked past the historic (looking rather ragged – at least from the outside) Peace Hotel built in 1930 by Sir Victor Sassoon, then hailed a taxi and spent the rest of the day wandering through the Yu Gardens and Bazaar (photo: right). Yu Gardens is a modern re-creation of an ancient Chinese city with flying-eaved buildings in a maze of alleyways and ponds. 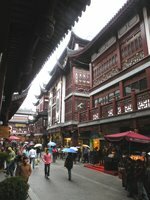 It contains hundreds of shops and is a favorite tourist destination. In spite of the poor weather, it was teeming with visitors when we visited. The one authentic building is the 1784 Huxinting Teahouse approached across a lagoon by a zigzag bridge. We interrupted our shopping to have lunch at one of the many restaurants in Yu Gardens. Naxiang Steamed Bun Restaurant was founded in 1900 and specializes in steamed buns famous for their “thin covers, full filling and delicious juice.” The restaurant consists of four dining rooms, some more elegant than others. They were all filled today. Naxiang also has a take-out window and it had a long line-up. We ordered two varieties of steamed bun and a curry pastry. Everything was tasty and carefully prepared. Part of the fun in the restaurant is the open kitchen, where four chefs dressed in full white uniforms with tall hats can be seen preparing the noodles and stuffing the pastry. The rain began again in mid-afternoon and that made catching a taxi back to the bus terminal somewhat difficult. We joined a line of about fifty people at a taxi stand. At the terminal we waited again with hundreds of passengers for the shuttle buses to take us back to the ship. Lots of interesting musical events listed at the Shanghai Grand Theatre; unfortunately, we did not stay long enough in Shanghai to hear anything but a gift shop vendor at Yu Gardens playing “Happy Birthday” on a miniature Chinese erhu (violin). The Diamond Princess departed Shanghai about 6:15 pm, and after making a 180degree turn, sailed back out the busy Huangpu River into the Yellow Sea, heading north.